I got a surprise this morning. According to my memory, Psalm 150 was a litany of exhortations to praise God with various musical instruments, with zero substantive theological content. As it turns out, the List of Approved Instruments is bookended by reasons to praise God, a context to establish why praising God is a good thing to do with your music. The lessons here are twofold: the best source for determining what the Bible says is the actual Bible, and also my memory is failing me in my old age. Let’s take a look at that theological content. We learn in the opening verse where God is when we praise him. The psalmist commands: “Praise God in his sanctuary; praise him in his mighty expanse” (1). The word “expanse” here is the Hebrew raqia: an extended surface or a thing that is spread out, like a hammered-out sheet of metal. In this context, it’s the heavens, spread out above the earth. I’m going to do a little theological interpretation here and say that the psalmist does not mean that God is literally up in the sky somewhere, as if we might bump into him if we could just get past all those birds and clouds and stars. I think he means that God is above us in greatness, and as we praise God, we inevitably praise him from a position of humility and lowness. But God is in the sanctuary too! God is in heaven and on earth. When we praise him, he comes down to inhabit the space we’re praising and enjoy our music. If we want to take this as a statement about what physical space God occupies, it turns out to be a statement about his omnipresence. God is everywhere. Verse two gives us that reason to praise that we often see in the psalms. The psalmist declares: “Praise him for his mighty deeds; praise him according to his excellent greatness” (2). As an Israelite composing lyrics for Israelites, the psalmist can expect the congregation to remember God’s mighty deeds: creating the universe, calling and guiding Abraham and his descendants, saving the children of Israel from slavery under Egypt. The psalmist’s apologetic may seem brief and unconvincing to us, but in an ancient Hebrew context, it would call to mind a broader history and an identity as people that God has cared for. The psalm concludes: “Let everything that has breath praise the Lord” (6). And if that doesn’t convince you to get up and sing of God’s greatness, I’m sympathetic to your perspective: sometimes I question just how great God is, after all, and words in a Bible may not persuade me. But I’m also sympathetic to the psalmist. I’ve seen God do good things in my own life, and I tend to forget them. Sometimes I need songs to remind me where I’ve come from: songs like Switchfoot’s “Shake This Feeling,” which I happen to be listening to right now, as I type this. 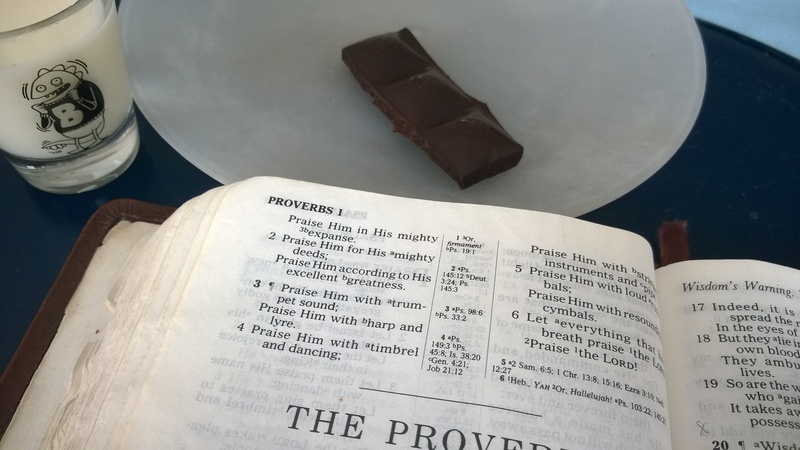 We’re wrapping up the psalms today, and we’re also wrapping up the last of the Chocolove Coffee Crunch. 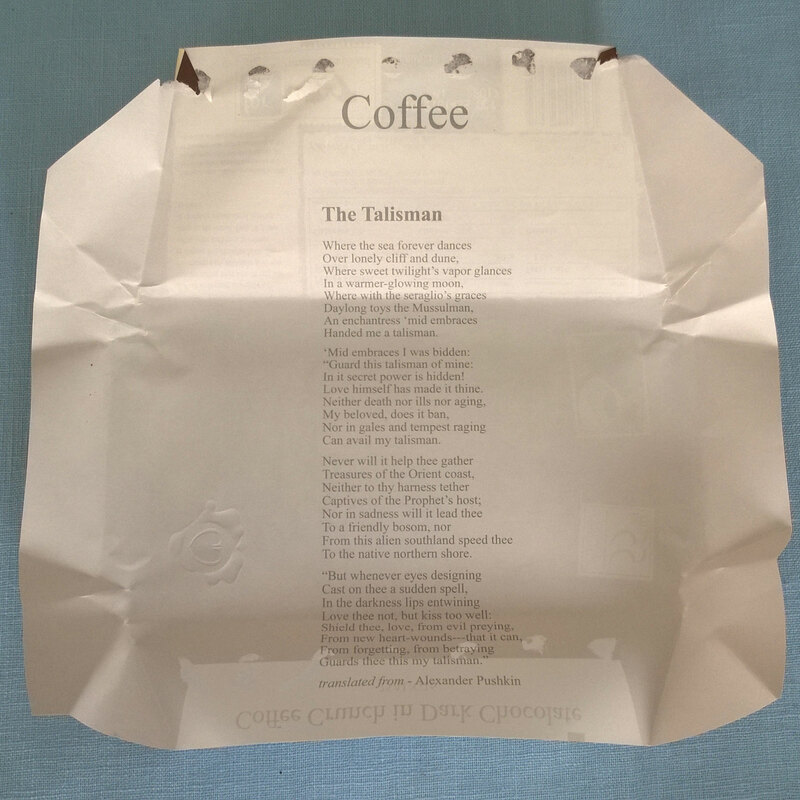 The interior wrapper contains a translation of a love poem by Alexander Pushkin about a magical talisman given to a man by his lover, which coincidentally is also about memory. Posted in Daily Reading, Old Testament, Psalms.Tagged bible, christianity, devotional, God, history, Israel, Judaism, memory, Psalms, theology, worship. Thank you making it real…. for this thoughtful, God- honoring journey through the Psalms. I don’t make it real. God makes it real; I just keep it real. Thanks for the comment!